These two prints are in an archival mat. Each print is 5x7 and the total frame size is 10x16. These prints include one of Mt. Hood and one of the Columbia Gorge. They are prints of watercolor paintings done by myself, Bonnie White. 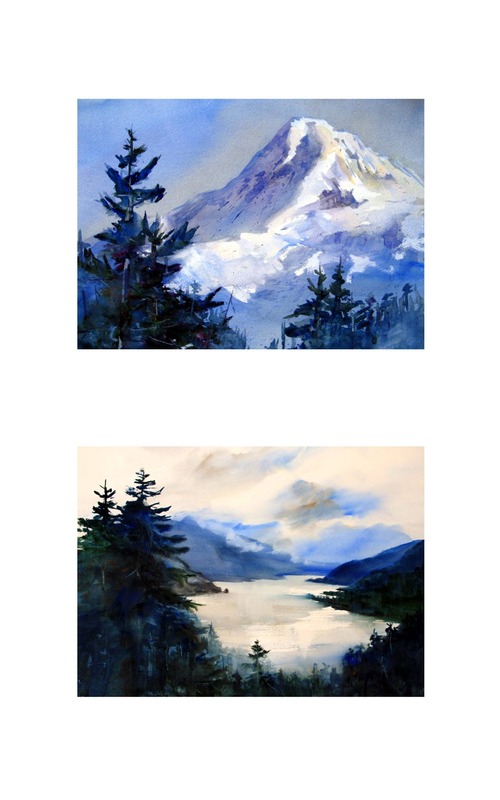 I am an award winning Columbia Gorge watercolor artist, living in the heart of the gorge. They are being sold either without a frame and glass or with a matte black Nielson metal frame, under glass, each price includes shipping to the continental United States. They make particularly nice gifts and or groupings. I am an established, award winning watercolor artist living in the Columbia River Gorge area of the western United States. I paint birds, wildlife, farm animals, pets and landscapes. Original paintings are also available at amazon.com/handmade/bonniewhite or bonniewhite.net and find my facebook page at bonnie white watercolor.